Dr. Muller at the 12th Annual Scientific Meeting held in October by the Caribbean Association of Orthopaedic Surgeons. Nassau, Bahamas — Two of the region’s top orthopaedic surgeons from Baptist Health South Florida in Miami, Florida, flew into Nassau recently for the Caribbean Association of Orthopaedic Surgeons (CAOS) 12th Annual Scientific Meeting, in which regional doctors come together to exchange new ways to mend common issues. The annual conference spanned in topics from sports medicine to trauma. 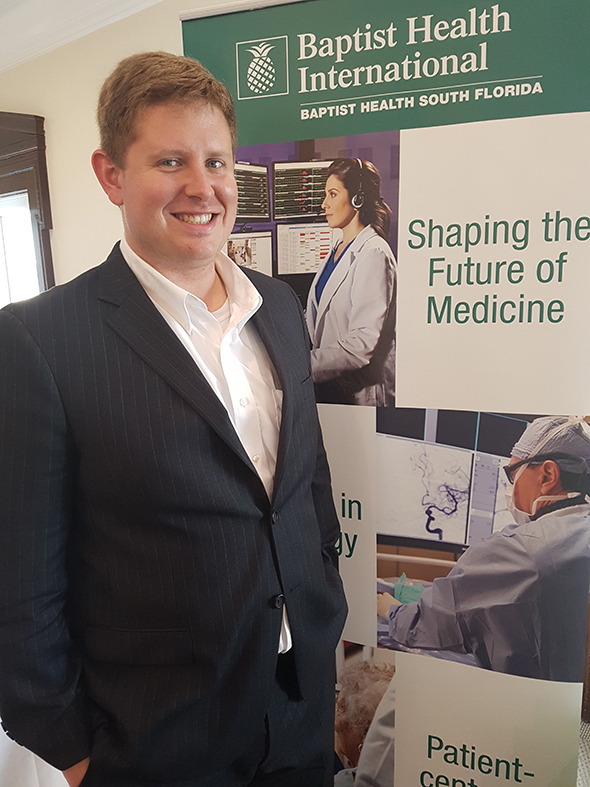 Charles Jordan, M.D., orthopedic surgeon at Miami Orthopedic and Sports Medicine Institute, part of Baptist Health South Florida, believes it is of the utmost importance that organizations such as the CAOS be supported in their endeavors to hold such academic conferences in the Caribbean. “Staying up to date with industry advances goes further than just the doctors in attendance”, said Baptist Health’s International Representative for the Caribbean, Kathleen Tuitt. She explains that the exchange of information can provide regional patients with the expertise they need without having to travel. Baptist Health orthopedic surgeon Joseph Grant Muller, M.D., who presented on lesser toe and hammertoe deformities, said that while the Caribbean registers many orthopaedic injuries with the feet and ankles, there are not many specialists in the foot and ankle areas. In the U.S., there are many surgeons who concentrate on one area as they have the population to sustain their specialization. Dr. Muller stated that in situations like this, it is a good thing many people in countries like The Bahamas were in close proximity to the U.S. for assistance.